Luckily we have a very good fish shop not far away from home. 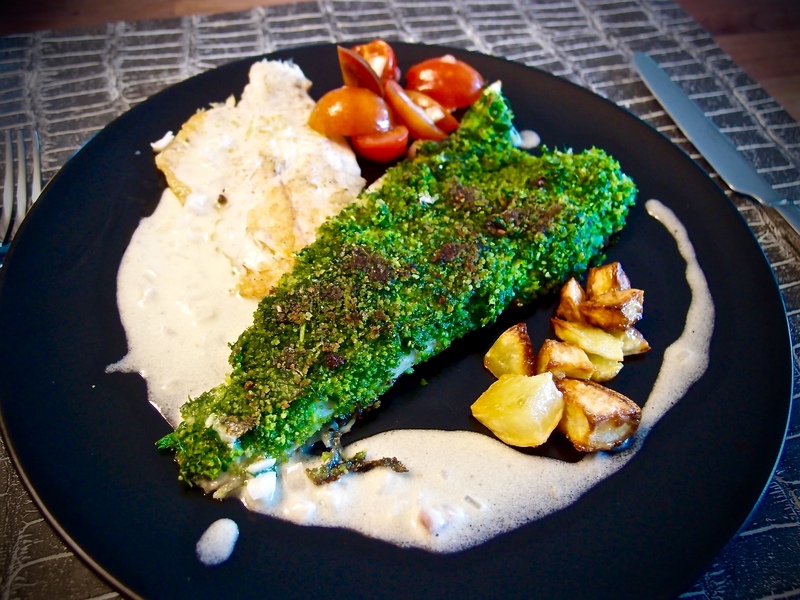 I bought some very nice Loup de Mer filets, this is what I made out of them! Lemon juice (roughly 1.5 fruits). In a mixer blend coriander and parsley. Then add the breadcrumbs and 2 olive oil spoon. In the meantime start to prepare the sauce. In a saucepan add the chopped echalottes and the wine. Let cook until the wine has evaporated. Then add the cream. Let it boil, then slightly put down the heat and let cook till it has reduced by half in size. Take off the heat and add the butter cut in cubes and the lemon juice. Season with the peppers and salt. Now coat 2 filets with the breadcrumbs mix (on the side without skin) and heat a big skillet with some olive oil. Put all 4 filets on the skin side on the skillet. Let cook for 3-4 minutes before turning. Finish another 1-2 minutes before serving. I prepared a tomato-onion salad and some rosemary-garlic oven roasted potato cubes.